At its December monetary policy meeting, the Swiss National Bank (SNB) left the target range for the 3m Libor at -1.25%/-0.25% with a negative deposit rate of -0.75%. The exemption was also left unchanged (at 20 times the minimum reserve requirements). In a slight change of wording, President Jordan reiterated that the SNB “will remain active in the foreign exchange market as necessary, while taking the overall currency situation into consideration”. If the SNB still thinks that “the franc remains highly valued”, it acknowledges that “overvaluation has decreased”, as the CHF depreciates further against both the EUR and the USD. For the SNB, the situation mainly reflects a decreased demand for safe havens and “remains fragile”, justifying the status quo in its interventionist stance. However, the SNB suggests this “fragility” is declining with strengthing economic outlook, both abroad and in Switzerland. The SNB growth forecast for 2018 is now 2%, and we believe the current positive growth outlook could bring back some moderate inflationary pressures in 2018. The most important figure of the conference was the SNB inflation forecasts for 2019 and mid-2020, which came out at respectively 1.1% (unchanged since March) and 2.1% (for 3Q20). The SNB also revised its inflation forecast for 2017 upwards (+0.1pp at 0.4%) and 2018 (+0.3pp at 0.7%). This shows that the central bank is very cautious about declaring victory on deflation, but is still eager to show that getting back to the 2% target in the medium term is possible. We see a possibility that a weaker exchange rate will lead to better growth and higher inflation above 1% in 2019, but whether that's enough for the SNB to follow the ECB in raising rates remains to be seen. In 2018, with the return of inflation being slow despite a dynamic economic recovery, we don't expect any changes in the monetary policy stance. Short-term interest rates will, therefore, remain negative. 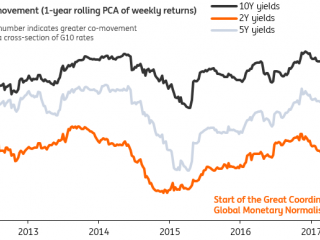 Moreover, it is likely that the long-term interest rates will continue to reflect low inflation expectations and hence increase more slowly than in the Eurozone in 2018. Negative rates and stable short-term interest rate spread against the Euro will remain SNB’s favourite tools to add downward pressures on the EUR/CHF which should reach 1.25 at the end of the year, with very limited FX interventions. In 2019, with stronger growth prospects and a CHF installed beyond 1.25 against the EUR by mid-2019, we think that the SNB will be able to imitate the ECB in raising short-term interest rates by 25bp in the second half of the year. They should, however, remain negative until the end of 2019. With inflation coming back towards the 2% target in 2020, the door towards normalisation will be then open.